Access to a fine beach, some lovely sea views, swimming pools, restaurants and bars. Insider information from residents in the Shoreline Apartments. 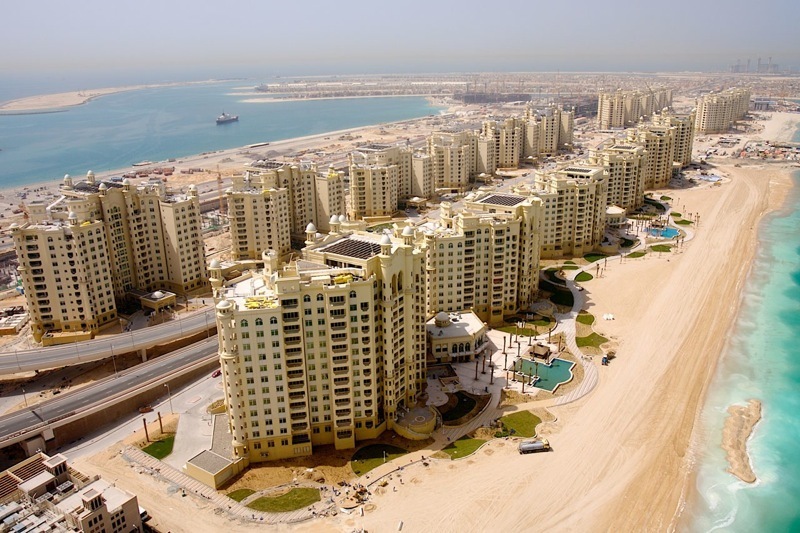 Apart from the fronds, Atlantis and other amazing hotels, Palm Jumeirah also houses The Shoreline Apartments. These low level buildings are situated on both sides of the Palm Jumeirah trunk which is the main road from Al Sufouh Road and leading up the the fronds, home to the outstanding detached villas on Palm Jumeirah. There are 20 buildings in total. Al Basri, Al Dabas, Al Sultana, JashFalqa, Al Hatimi, Palm Terrace, Al Haseer, Al Nabat, Al Msalli, Al Das. Al Habool, Al Anbara, Al Sarrood, Al Hallawi, Al Tamr, Al Shahla, Abu Keibal, Jash Hamad, Al Hamri and last but not least is Al Khushkar. Between 10 and 12 storeys high the Shoreline Apartments offer 1, 2, 3 or 4 bedroom apartments and duplexes with attractive balconies. The beaches are kept private to the residents by 24/7 security guards at all buildings. There are some small parking areas for visitors otherwise parking is underground. The previously vacant plots around the Shoreline Apartments are now being developed. Our Dubai Sherpas will provide further details as soon as possible. The Palm Monorail can be seen from some of the apartments. This is an interesting journey to Atlantis from the beginning of the Palm Jumeirah trunk. It’s amazing to think that it has been in operation since 2009! It basically starts at Al Sufouh Road and ends at the Atlantis Hotel. No other stops are open at the moment so it shuttles back and forward. What’s it like to live in the Shoreline Apartments? What about the journey to and from work? Shoreline Apartments holiday homes – how did you find yours? Are there any problems or is everything hunky dory? Is it plain sailing to get to the beach? Do you have access to a swimming pool? Is there a residents’ association? An Owners’ Association? Did you buy your apartment? If so, how long ago? Have you had any issues with Nakheel? The Title Deed? For every detail you provide, you are giving others the chance to make an informed decision about life in the Shoreline Apartments. Your news is our news. All names and personal details will remain confidential to the Editor of the Dubai Survival Guide.